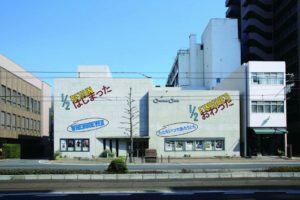 The new triennial art exhibition Okayama Art Summit will take place at various locations across Okayama, Japan opening on October 9 and running to November 27. Directed by New York-based artist Liam Gillick, 31 artists have been chosen to respond to the theme of ‘Development’ featuring work by Katja Novitskova Rachel Rose Trisha Baga Rirkrit Tiravanija Motoyuki Shitamichi Ahmet Öğüt Simon Fujiwara Hannah Weinberger and Ryan Gander among many others. Taking place within a city that is under constant and heavy urban development, Gillick’s chosen theme is fitting as well as multi-directional. Spanning ideas of architecture and capitalist progress to gaming and cinema, there is a freedom to play with the political, formal and ideological structures inherent in this word. The exhibition will provide a strata of examination, from looking back to looking forward, where artists “deploy modes of withdrawal and resistance in the face of the dominance of “ideas in development”. 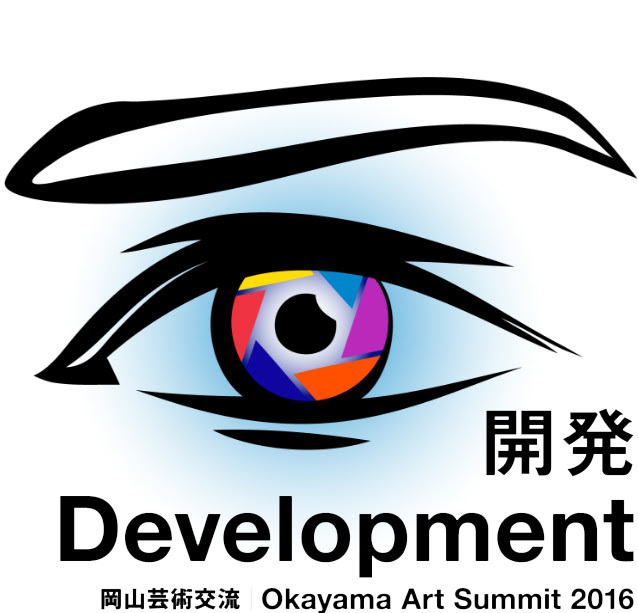 Okayama Art Summit 2016, Promotional Image. Courtesy the Okayama art Summit organisation. Trisha Baga’s LOAF- A blurry eye exam, or the sourdough hippocampus concerns itself with the boundaries, particularly boundaries of dimensionality. For this solo exhibition running at Berlin’s Société from September 8 to October 15, the New York-based artist uses a range of media —including video, sculpture and installation —in works that are infused with a sense of semi-permeability between forms and concepts. Her videos especially, express this feeling of aesthetic and spatial displacement (and re-placement) most clearly in her use of 3D filming, where one moment the viewer is immersed in a street scene in New York, and out of nowhere in floats some form of digital detritus, a doughnut with sprinkles, for instance. Trisha Baga, ‘Oasis’ (2016). Installation view. Courtesy Société, Berlin. ‘Ghost’ (2016) is shown in the spacious east-facing gallery, a feeling of never quite being anywhere, yet still existing in a physical —as opposed to fully virtual —space pervades. The video is something like a psychological travelogue, the viewer encounters families, cities, even elements of history as objects trespass and then come to dominate the range of vision. The stacking created by the 3D technology feeds forward into the actual material territory of the space. An actual desktop is positioned near the lower edge of the film, and shadows from the objects it supports meld with the shadows at the edge of the projection. 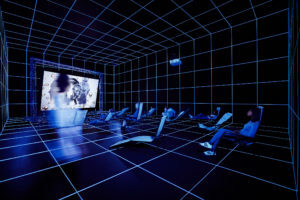 Baga’s ‘Ghos’, then, presents something of a riposte to the easy fetishisation of a digital aesthetic; its interstitial character means that it has no genuine location, but, also, that it is not restricted in its capacity to interpose itself between the viewer and the world of objects, forces and territories. The video in the northernmost room of the gallery is even more engaging. Consisting primarily of images of plants shot in the dark, the viewer enters through a curtain of plastic sheeting and is immediately placed in a thicket of a supremely invasive, yet also wholly inorganic species. Depending on one’s position, the plants reach out to you, recede, sometimes slash through other viewers nearby. The rough-hewn quality of the display serves to countermand the imperatives of a gesture toward the natural sublime. One stands amid boxes and bubble wrap haphazardly littering the corners of the room. This is a landscape from the age of the Amazon drone. Trisha Baga, LOAF- A blurry eye exam, or the sourdough hippocampus (2016). Exhibition view. Courtesy Société, Berlin. Trisha Baga’s LOAF- A blurry eye exam, or the sourdough hippocampus is on at Berlin’s Société, running September 8 to October 15, 2016. Header image: Trisha Baga, ‘Ghost’ (2016). Installation view. Courtesy Société, Berlin. As with Madonna y El Nino, Trisha Baga‘s’ most recent exhibition Rock at Vilma Gold employs tangential narratives. Within them environmental change and pop music echo the increasingly fragmented logic of Internet culture. The fact that Baga’s video installations initially look cheap and slightly haphazard is a clever device for getting you with your guard down. Grounded in materiality and process, there are no clear edges to this work and upon entering the space it’s hard to know where to walk. 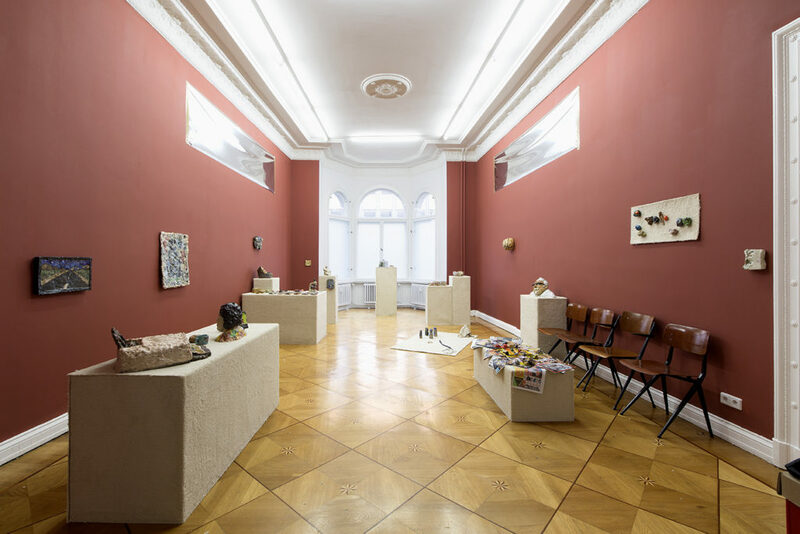 The gallery itself appears more like a workspace where during installation, the artist, using whatever items are at hand, neglects to discard those that aren’t needed. Small lumps of Blu-tack remain on the wall and extension cords lie on the floor unplugged. It feels transient and without intention. Trisha Baga, ‘Rock’ (2012). Image courtesy Vilma Gold. The deliberateness of these objects only becomes apparent over time and happens so unexpectedly that they are fantastical moments. A box stuffed with packing plastic casts a ghostly shadow of a huddled figure, which is only revealed when the video projection recedes into darkness. A round desktop mirror sitting atop this box is the head. 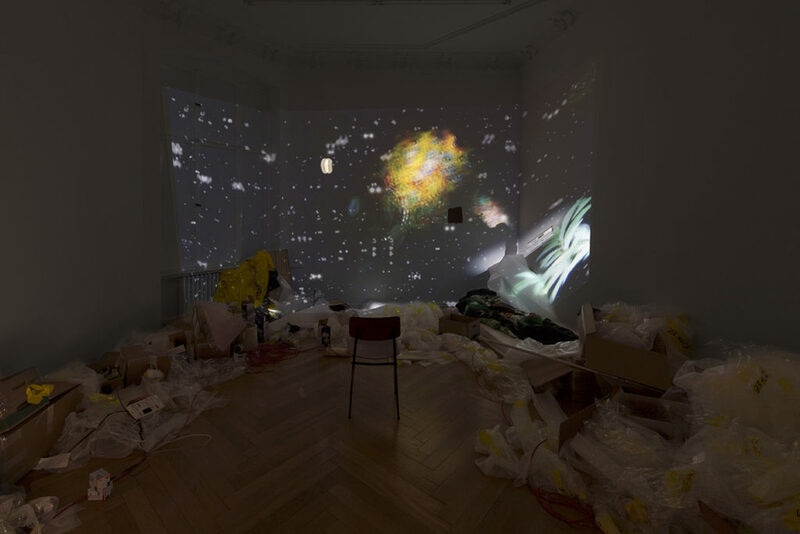 When a second projector goes, the mirror bounces distorted imagery across the wall, while the plastics glow and refract coloured light throughout the room. These simple, makeshift phenomena feel as though they might have been stumbled across while Baga was playing in her home. There’s the sensibility of youthful experimentation to this artist’s work belying its sophistication and resourcefulness. The first video ‘Plymouth Rock’ illuminates a whole wall at the far end of the gallery, across which float neon jellyfish and shaky hand-held footage of tourist attractions. The artist has then re-shot the footage, overlaid with daubs of paint, moving geometric shapes and glimpses of her own body. A soundtrack of badly dubbed pop is then often then confounded by a voice coming from behind the camera. The second video ‘Hard Rock’ was shot in the synthetic landscape of a penguin enclosure while being serviced by a cleaner. Both works interrogate leisure and heritage, where associated ephemera expire so quickly they too become relics; souvenirs and home made holiday movies, void of nostalgia, simply look out-dated. It is this inherent disposability, resulting from Baga’s intervention, that becomes the most interesting by-product of the once-special moments. Visually, comparisons could be drawn from the low budget techniques of Arte Povera coupled with the neo-psychedelic palate of 80s music videos. 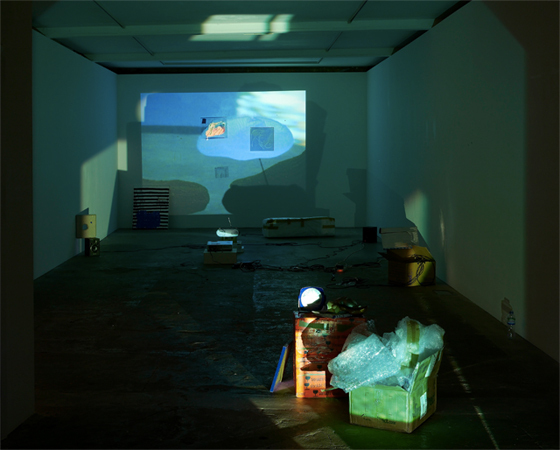 Trisha Baga’s Rock runs from April 5 to May 19, 2012. Header image: Trisha Baga, ‘Hard Rock (2012). Install view. Courtesy Vilma Gold, London.